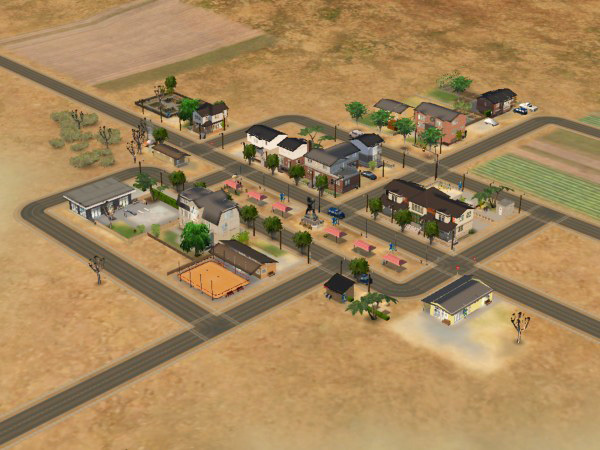 Baskerville is a small town in the desert, complete with lots but no sims. 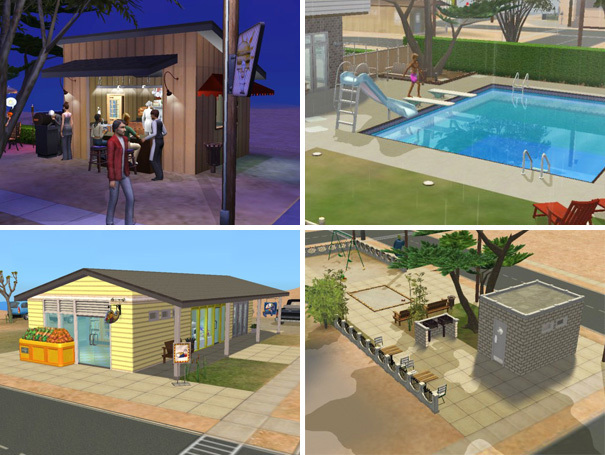 Requires Nightlife, OfB, and Seasons. Non-NL users: It is safe to give this a try; see post #113 of this thread (duckman768): "Obviously the objects that came with NL don't show up but I have had no problems playing this neighborhood so far." Non-OfB users would have to rebuild quite a bit, but as long as you have Seasons installed, this is compatible. Baskerville will install as N513. 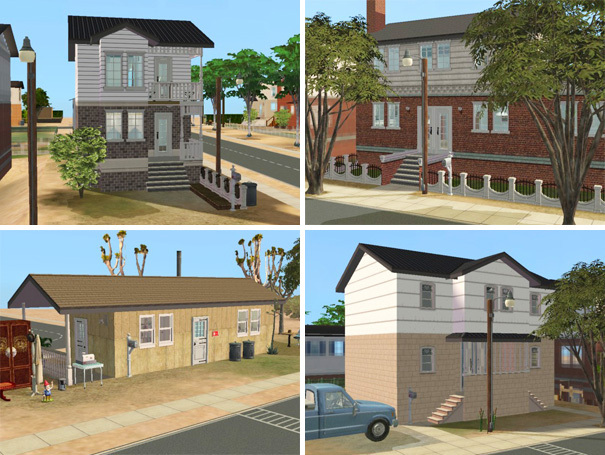 Made with the Empty and Cleaned-up Templates by SaraMK and Argon @ MATY -- to the best of my knowledge it contains no playable sims, townies, NPCs, or other traces of sim life. Pets users: If you don't want your game to generate random pets when you start playing, the thread on MATY has an empty Pets template too. Thanks to Juliejaz1 for reminding me! This is a seaside location with ample opportunities to build beach lots, small street layout (no cameramod needed) but still with room to expand. The neighbourhood is 100% flat in the buildable areas -- I flattened it out as far as I could reach with the default camera --, the sc4 terrain is flat in the central part but may have very slight slopes elsewhere. Street level is 15 clicks above sea level, so you can have basements everywhere with no danger of flooding. 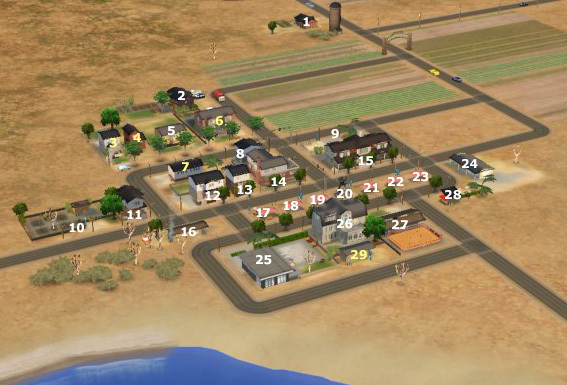 Baskerville includes 15 community and 14 residential lots, 7 of them starters; see follow-up posts for tons of pictures and detailed descriptions of each one. Five of the residential lots (marked in yellow) didn't make it into the main download due to the 10MB size limit; those are available below as separate files. The lots are small in general, between 1x1 and 2x4; the only larger ones are the public bath and the car retailer (both 3x3). The empty block on the right side of the map is 5x3. All houses are furnished for at least 2 sims, except for the upstairs apartment in 3 Main Street which is unfurnished. Every house includes as a minimum the usual starter equipment (double bed, table and seating for two, bookshelf, lights in all furnished rooms and outside, toilet, bathtub or shower, fridge, kitchen sink, phone, trash can, smoke detector, burglar alarm) and one or more driveways. Most of the houses include more than that. 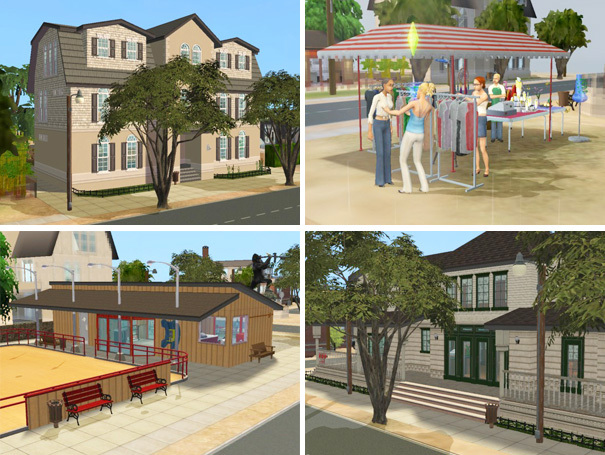 All lots are playtested between 2 and 8 sim days (residential) or at least one long visit (community), except for the empty market booths (they make excellent cheap starter businesses, that's why I've left some of them empty), Birch Alley 4 and Bay Drive 1. Community lots are tested only as regular visitable lots, not as owned businesses. Of the school I've only tested the residential part, not actually running a school. All lots are tested for adequate lighting at night. The houses on Main Street are using the same grid as Backdoor Lane. 4. Start your game: Baskerville should appear as last entry in your Neighbourhoods menu (unless you already have one that has a higher number). Baskerville will be N513. In case you already have a N513 hood, rename the folder you downloaded from here and all files inside it that start with "N513_" (the ones in the Lots and Thumbnails subdirectories too) with a number that you don't already use. Anything up to "N999_" works, in my experience. 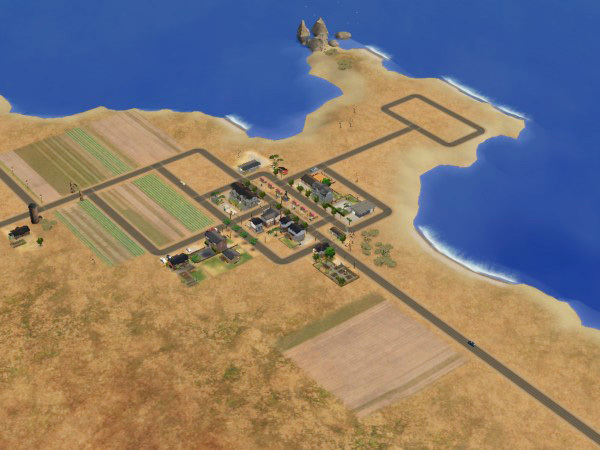 Alternatively, if you want this to be a subhood for example, or if you want your default townies in it, you can also install the hood as above, then use the sc4 terrain to make a new (sub)hood, move the houses over to that one and delete Baskerville. I can heavily recommend all of MaryLou's window fixes, for this neighbourhood one of them is especially important: her global light fix for the OpenMe 2-tile window that Maxis broke and never repaired. Since I have used this window in one or two houses, you should install this or they will be pitch dark inside. 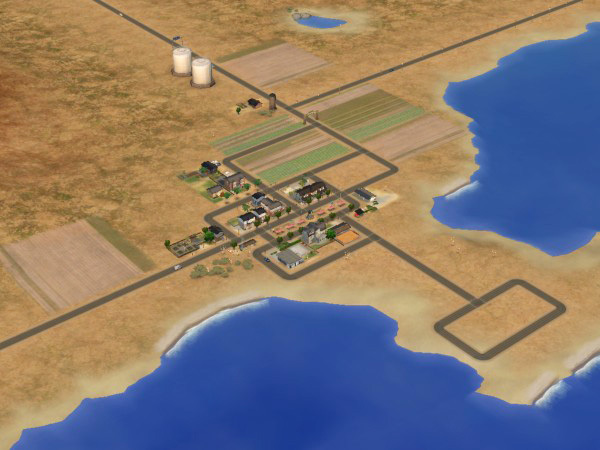 Also, if you want to get the most out of the farm houses and the market, you should try the Produce Packing Station by Paladin available at SimWardrobe (Sims 2 > Objects > Business Facilitators) -- it allows you to put produce in crates and sell them in bulk, thus making it possible to actually feed a neighbourhood with your farmers' products (sims won't stand there and ponder forever whether they should buy this or that single tomato). There is no custom content included with the extra lots (but some is required), which means you need to download "baskerville_customcontent.rar" along with them, even if you only want those lots and not the rest of the hood. If anyone could take a look at this in SimPE and confirm that it's really really empty, I'd be much relieved. I've already asked two potential testers but did not hear back from them (seems to be holiday season) -- from my own experience, the MATY templates work as advertised (I use them a lot) so there is very little to worry about, but still. Please don't PM me with downloading issues or build mode problems (post in the appropriate forums instead) and don't ask me for sc4 files or Body Shop content (I do lots and won't consider anything else). Any feedback related to this thread, please post here instead of PMing me. Thank you.